The MoMo Momma: And MoMo's make four! Sunday was a great day...I was getting used to my braids Aunt Ladybird had done on Saturday...Kijafa and Kendall snuck in ... Nadia, Jernee, Amaka & Nana came to visit...everything was perfect. It took me out of my 2 week blues! I was ready to face week 3 and beyond! Sunday Night was when all the action began I went over for NST testing around 8:30 (just in time to get on the monitors before Desperate Housewives came on!) My wonderful Nurse Jill, was very patient with Baby A (who we now know as Lily)...we were having a hard time keeping her on the monitor...she would jump on and off...and was a bit irregular but nothing that we hadn't see before. Everett and I left testing at 10:45 and headed back over to our room. My WONDERFUL Night Nurse, Stephanie, came in to do my vital signs and take a listen in on the babies through the doppler monitor, we could tell Lilly's heart was racing...she left to go get my regular nightly pills and then came back. While she was gone Everett and I discussed her doing the doppler again b/c we were concerned...by the time she came back with my pills, she had already called over to the NST nurse to tell her what she heard...and told me I was going back. I Headed back over to the NST center and got back on the monitors...I told Everett he could stay behind it was midnight and he had to work, so I didn't want him to be up late, and I THOUGHT I would only be over there for a half hour at most. By 1:15am I was out of my real clothes into a hospital gown with an anesthesiologist, 4 nurses and 3 doctors all standing over me, with forms ....you know the ones that say "sign here, you could die" or "Yeah we can make a mistake, but you are releasing us from liability" lol :) It was very clear we were going to have these babies, RIGHT NOW. Lily's heart rate was out of control...she would go up to 180 then shoot down to 105, 90, 35 beats per minute. Something was definitely wrong she was in distress. The Nurse went to get Everett and he walked into the NST room that was packed at this point! I couldn't believe this was actually happening at this very moment, they raised the bed and wheeled me away, that is when the tears started flowing like Niagara Falls. I had never felt so close to LIFE and DEATH at the same time. It was a feeling you have to experience to truly understand. I was whisked into the O.R. Everett was still over in NST getting scrubbed in. In a matter of 10 minutes I had a Spinal tap in, my binki line shaved for surgery and a catheter in. It was all happening too fast... I have never said the Lords Prayer so fast and so frequent in my life. Before I knew it I could no longer control my legs, belly and feet. I was strapped down and just waiting for the surgeons to do their thing! At 2:21am Lily arrived (1lb 140z 15.4 inches), she had a knot in her cord that was causing her heart rate to fluctuate so much and she had the cord around her neck. At 2:23am McKenzie (2lbs 1 oz 14.8 inches) arrived. It was so strange not to hear them cry, I had to keep asking Everett if they were okay, he was the only one that could see them since I was strapped down. 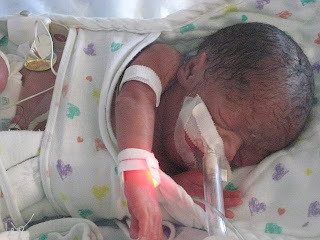 They were moving and breathing and being taken care of by 3 NICU nurses each. After I was all put back together, I was wheeled off to recovery, where my Mom, Melissa and Everett were. I couldn't believe the babies that were once inside of me were on the outside world. It was amazing! 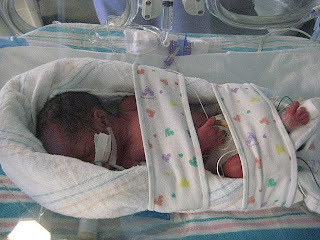 Everett and Mom were able to see the babies around 9am the morning of their birth, the NICU had to stabilize them. I wasn't able to see them till 8pm at night. Lily and McKenzie are doing well right now, they are breathing with the help of oxygen but they are breathing on their own 89%. The have feeding tubes and IV lines in. They are very pink and hairy :) and they are OURS! God is sooooooo GOOD! This day reminded me the reason why was here, I would of never know Lily was in distress at home, and could have possibly shown up for my next appointment with only one surviving baby in womb. I am so grateful for the knowledge and resources that my Doctors and Nurses had. We ask for your prayers for our little girls as they finish their growing in the NICU, they will probably be in for 6-8 weeks. I will continue to update their progress as the weeks go by. I agree with you. You never know why things happen, like you having to be there at the hospital for observation, but God knew. And from you being there, they were able to be sure your babies were taken care of. I will continue to keep you and your family in my prayers. I have faith that you will be okay and be brought through this just like all other obstacles. As soon as I can I am zooming down 95 to see you and those munkins. Welcome to Motherhood!!! P.S. Reem is suppose to give you a big hug from me. K Love was supposed to pass the message not to sure if she remembered how...lol. Anyway, I want you to know that you and the new additions are in my thoughts and prayers. I have been very specific and direct with my requests and I know God will answer. Stay in great spirits and prayerful, New Mommy! Get some rest and don't try to stand too soon! I'm so glad the girls are safely here. I got tears in my eyes reading about when the realization hit that it was serious and the girls needed to be taken....now. I remember having a scare (but as you know my baby recovered) and praying, praying, praying and trying not to hyperventilate. You did such a wonderful thing by going inpatient........how are you feeling? How are the girls doing today? You're (the whole family) in my thoughts and prayers. Congratulations!!! God is sooo GOOD!! He sent you to that hospital for a reason! You have been so graceful and strong throughout this process! Many of people would have buckled under the pressure of just being in the hospital on bed rest! I can't wait to meet Miracle and Blessin Sands!!! that was the fastest delivery I've ever witnessed. But I'm so happy i was there to see my granddaughters come into this world. There isn't a person that i know who believes in God that is not praying for them right now. They are beautiful,and God given and i will always treasure this times as it reminds us ALL you precious life is. Congratulations on the newest additions to your family. The Lee Family has you at the top of our prayer list. Leeann and Everett, congratulations! The MoMo's are here! My heart was racing as I read your blog about the babies' births. I have been praying for your strength and patience during this time. Leeann, you have made the wonderful world of motherhood proud! Motherhood, there's nothing like it! Everett, as husband, father and friend, has been a fine example for males young and not-so-young to follow. Leeann, you never failed to let us know that he was there, present and by your side through it all. You both have made many sacrifices all in the name of love, as it should be. Remember, children are a heritage from the Lord. God has shown you both favor in trusting you with these two precious lives. HE will supply all your needs according to HIS riches in glory. God will never put more on you than you are able to bear. Continue to talk to HIM and wait for HIM to speak to your spirit! It's wonderful that you both are surrounded by the love and support of family and friends, but remember God is always there, always! Congratulations again and I will see you soon! P.S. Things have definitely changed since our time together at Smith's Landing, huh?! WOW!! It warms my heart to see those babies. Congratulations to you and Ev on the arrival of your daughters. Jordan, Ellie and I will continue to keep you in our prayers (we light a candle for you every night). I will be in Toronto in two weeks, and I am hoping to be able to come to Baltimore for the weekend (between conferences). Pumping Ain't easy...but it Sure is FREE!